Lindsey Vonn Wins Bronze Medal In Downhill At Pyeongchang Winter Olympics : The Torch In the downhill at what's believed to be her final Olympics, Lindsey Vonn hit speeds of nearly 70 mph as she scorched down the mountain. "I gave it all today, skied a great race," she said. 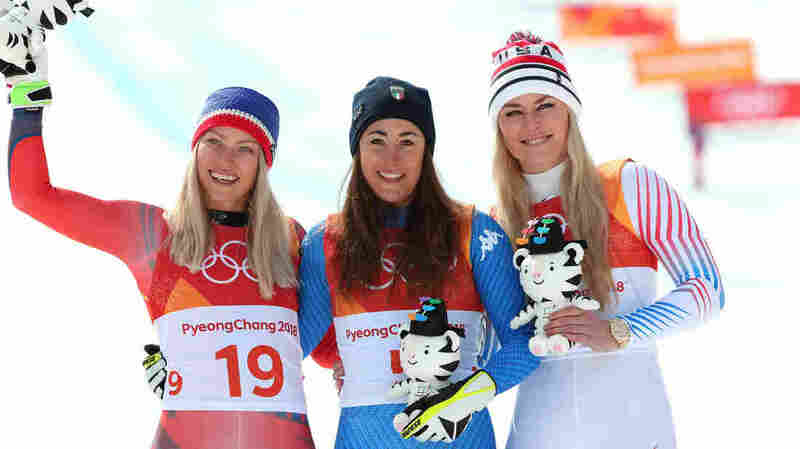 Bronze medalist Lindsey Vonn, right, celebrates on the podium with gold medalist Sofia Goggia of Italy, center, and silver medalist Ragnhild Mowinckel of Norway, after the women's downhill in the Pyeongchang Winter Olympics. 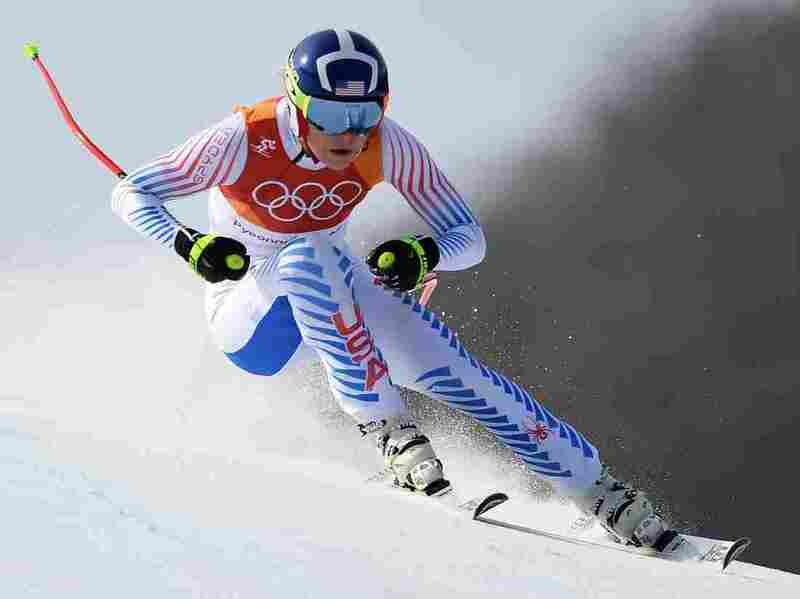 U.S. skiing star Lindsey Vonn turned in a time that was a half-second off the lead in the downhill Wednesday in South Korea, fast enough to win a medal in her final downhill race of the Pyeongchang Winter Olympics – and almost certainly the last of her Olympic career. It's the third Olympic medal overall for Vonn. "It was tough to contemplate this being my last Olympic downhill," Vonn said afterward. "I struggled to try to keep the emotions together, but I left it all on the mountain like I said I would." "I gave it all today, skied a great race. Sofia just skied better than I did," Vonn said, referring to the top finisher, Italy's Sofia Goggia. "I thought I executed the line really well on the whole course, perhaps too well," Vonn said. "I tried too hard to stay on the perfect line. But I have no regrets." Lindsey Vonn won a bronze medal in the women's downhill at the Pyeongchang Winter Olympics. Going into today's race, Vonn, 33, was already the most decorated female skier of all time. She put together a solid run, having trouble in only one section in the middle of the downhill course at Jeongseon Alpine Center in Pyeongchang. Starting seventh in the field of 39 racers, Vonn hit speeds of nearly 70 mph as she scorched down the mountain. Vonn's time of 1:39.69 put her 0.47 behind Italiy's Sofia Goggia, who won the gold medal after being the fifth skier to race. As she waited to see where she would place, Vonn said, that she was optimistic about getting on the podium, "but anything can happen as you could see from the super-G, but there's no snowboarders in the race this time" — a reference to the Czech dual-sport athlete Ester Ledecka, who came out of nowhere to win the women's Super-G race. One after another skier flew down the hill, and it seemed as if Vonn's time might put a silver medal around her neck. But then Norway's Ragnhild Mowinckel blistered past the American to take silver, only 0.09 behind the leader. The downhill course for Wednesday's race had 38 gates, with a vertical drop of 2,395 feet over a length of 9,104 feet. In her Olympics career, Vonn had previously won two medals – a gold in the downhill and a bronze in the Super-G. She won both of those medals at the 2010 Vancouver Games, when she became the only American woman ever to have won gold in the Olympics' downhill. Vonn has coped with a string of serious injuries in her career, including surgery on her knee — which she then reinjured, forcing her to opt out of the 2014 Sochi Games. Today's race did not include Mikaela Shiffrin, the 22-year-old American skier who won gold in the giant slalom earlier at these Olympics. Shiffrin had initially planned to race in the downhill, but she opted out after scheduling changes due to weather stacked her events too close to one another. Both Vonn and Shiffrin, who won gold in the slalom as an 18-year-old in Sochi, plan to race in the alpine combined in South Korea. Scheduled for Thursday, the event includes two races, the downhill and slalom — the same disciplines in which these two talented American skiers have previously won gold medals. Barring a miracle comeback, this is almost certainly the last Olympics for Vonn, whose pro career includes a streak of dominance from 2007 to 2012, when she mixed four overall championships with one second-place finish. In an even longer streak, she was the No. 1 women's skier in the downhill for eight years, from the 2007/2008 season to 2015/2016.